Making Tracks targets young people at elevated risk, including those on the fringes of the criminal justice system and those who are NEET (Not in Education, Employment or Training). We expand the horizons of the young people and offer up to a year of progression support, including: taster sessions; an intensive workshop week which culminates in a live performance to the local community; a series of follow-on music sessions tailored to the group’s interests; one-to-one sessions with our Personal Development Coordinator. Working with partners including local youth organisations, YOTs and The Prince’s Trust, the young people receive pastoral support and bespoke guidance to further development opportunities. Making Tracks has been validated as Project Oracle Standard 1. 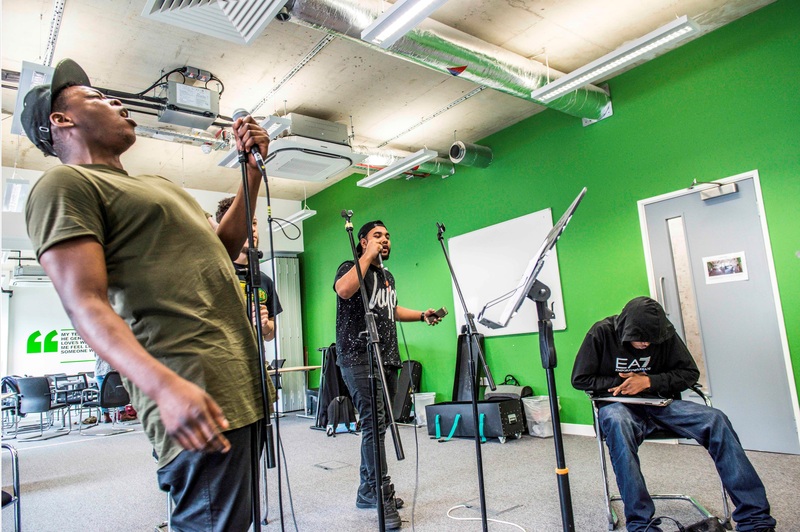 During the intensive project, over just 5 days, led by the Irene Taylor Trusts project team, the young people taking part learn how to play instruments, form a band and write their own original songs. 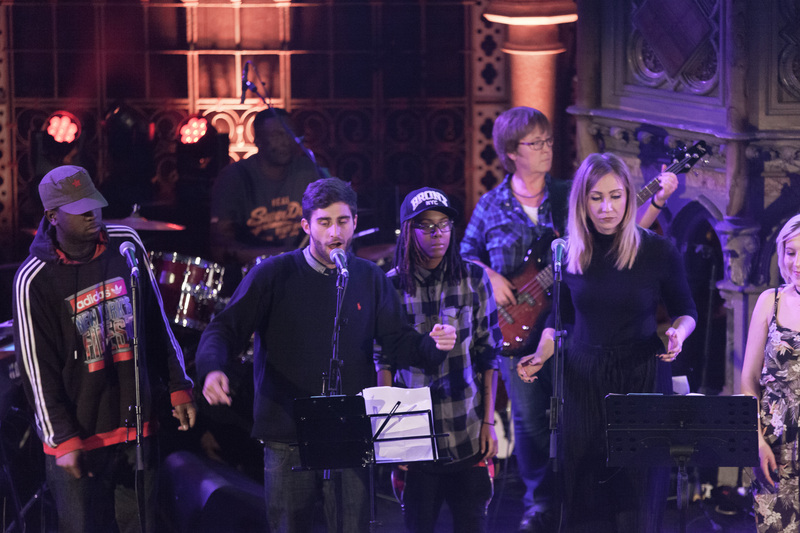 The group is also supported by specially trained musicians from our ex-prisoner programme Sounding Out, who have first-hand experience of the grim reality of spending time in prison and the life-enhancing power of music. As well as performing their original songs live, the new band make recordings of all the tracks, which are then professionally mixed for a special CD for participants to share with friends and family and posted online to the Making Tracks Soundcloud page. Central to Making Tracks is guiding the young people, buoyed with their raised self-confidence, on to further opportunities. Our Personal Development Coordinator Lauren works closely with the young people to help source suitable progression routes and development opportunities, and has recently helped young people on to courses with Oval House, National Youth Theatre, the Roundhouse and many others, as well as recruiting Making Tracks alumni to talk at events, perform at concerts, or take part in our Young Producers scheme. The pilot Making Tracks project took place in Lambeth in 2011. It became a core part of our work from 2012 on-wards and projects have now taken place in the London Boroughs of Tower Hamlets, Newham, Lewisham, Croydon and Hammersmith & Fulham. Making Tracks: North West partnership with TiPP: In 2018 we realised a long-term strategic aim to bring Making Tracks to the North West, working in partnership with TiPP. A two-year pilot will allow us to work with young people in and around Manchester, as well as to train musicians in the region, who learn by working alongside our experienced project team.